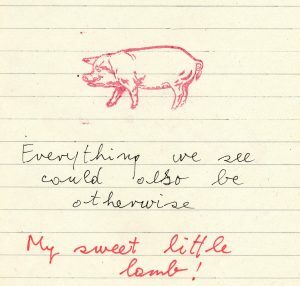 My Sweet Little Lamb (everything we see can also be otherwise) by Sabina Sabolović, member of the curatorial collective What, How & for Whom/WHW. Sabina Sabolović will present the practice of the curatorial collective What, How & for Whom/WHW, which is concerned with continuous reconfiguration of the relationships of artistic and cultural production with notions of history and politics. The presentation will be focused on their most recent project My Sweet Little Lamb (everything we see can also be otherwise) they co-curated in collaboration with Kathrin Rhomberg. Titled after a work by Croatian artist Mladen Stilinović (1947-2016), the project was inspired by his life-long anti-systematic artistic approach that searched for more autonomous ways of artistic production. After six exhibition episodes, taking place from November 2016 to May 2017 in independent art spaces, artists’ studios and private apartments in Zagreb, the project’s epilogue has been staged at The Showroom, London in late 2017 (co-curated with Emily Pethick). Based on the Kontakt Art Collection from Vienna, which includes seminal works by artists from Central, Eastern and South-East Europe from 1960s to the present, the project juxtaposed the collection’s canonical works with a number of historical and contemporary works in order to address and reframe some of the recurring themes that stem from the collection, such as radical utopianism, figure of dissident artist, questions of gendered bodies, political subjectivities and engagement, and the status of public space. The lecture will be held at the Museum of Contemporary Art Skopje on Wednesday 7th of March 2018 at 8 pm.